The last month or so has been a bit busy for a couple reasons, one of which is twice-a-week treks back and forth to physical therapy. (One underappreciated aspect of running: it often requires very little commuting time. 90% of my runs start from my front door.) But I can’t complain about PT, because I’ve been incredibly blessed to get to run on an AlterG treadmill during this rehab, which is basically the kind of treatment professionals get. Injured runners are always looking for ways to “run” without really running, without the pounding that might hurt healing legs/ankles/knees/feet/hips. We “run” in the pool, on ellipticals, even in our daydreams on the bike. 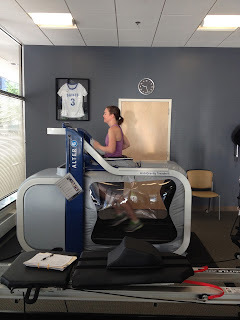 The man was Sean Whalen, the year was 2004, and a treadmill, called an AlterG Anti-Gravity Treadmill, was created. It uses air pressure to displace a percentage of the runner’s body weight; running at a lower portion of body weight puts less pressure on joints and bones, allowing injured people to run—at least, kinda sorta—while rehabbing. Basically, you put on shorts with an attached skirt/tutu that zips into the machine. (Skirt/tutu seen here.) Once zipped in, your lower half is encased in a bubble, which gradually fills with air when the machine turns on. It continues to blow up until you are slightly floating, standing on your toes. (This is to weigh you.) Then you dial in how much percentage of your weight you want to run at, and it adjusts the air—filling up the bubble more to run at less weight, or filling less to run closer to your real weight. 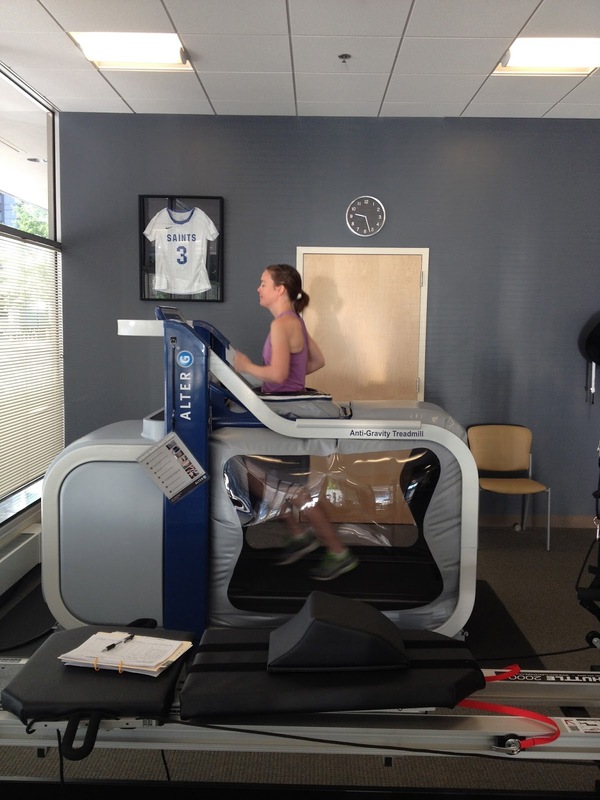 The rest works like a regular treadmill—you adjust speed, incline, etc. The first time I was on it, four weeks post injury, I ran one mile at 45% of my body weight (aka, what I weighed in elementary school). 45% body weight feels like running on the moon. (Supposedly the machine goes as low as 20%, and I seriously don’t understand how you could keep your feet on the ground at that percentage. It was hard enough at 45.) You feel suspended, like you’re bounding along, and you have to consciously plant your feet. It’s hard to feel like you’re running at all, but fortunately we did 45% just that first day, to see how my leg felt. It felt fine, so the next time we bumped up to 60% and gradually progressed body weight and distance from there. Maybe I just got used to it, but 60+ feels at least semi-normal, although I still have to consciously focus on maintaining a quick stride. The air does push on your stomach the whole time (if you didn’t have to pee before, you will now), your legs get extra sweaty in the combination of regular shorts + shorts/skirt/tutu, and it’s a little hard to keep your arm swing normal with the bubble in the way. But the main problem is that they are wildly expensive so very few facilities have them. (Though, reportedly, Tom Brady owns two.) Thus, the trekking back and forth to use it. Of course, I’ll take having to commute to jog over not running at all. I feel like a professional runner when I’m there, and picture all the running celebrities I’ve watched rehabbing their injuries on AlterGs over the years. Although it’s not quite “real” running, it’s darn close—far closer than other options. And afterward, I feel surprisingly good—happy and calm like post-real-running—not something I’ve been able to capture post-pool.